The much anticipated summer holidays have just begun but boredom may have already set in. Boredom comes with side effects too. Crankiness, depression and possibly getting into trouble can result. These kids are just not fun to be around. Another side effect of boredom and inactivity is over eating. According to the World Health Organization childhood and teen obesity is 10 times higher than it was in the 70’s. In most households the TV and the fridge are in close proximity. TV ads bombard the viewers with tempting fast foods. The combination of inactivity and high sugar foods is not a good recipe for healthy kids. How do you combat summertime boredom? Going to play outside like we did in the 70’s doesn’t really work anymore. So how do you replicate the onscreen excitement of a video game in real life? How about a moto camp adventure. Turn virtual into reality. Kids with a passion are much less likely to suffer from the chronic issues surrounding today’s lifestyle. 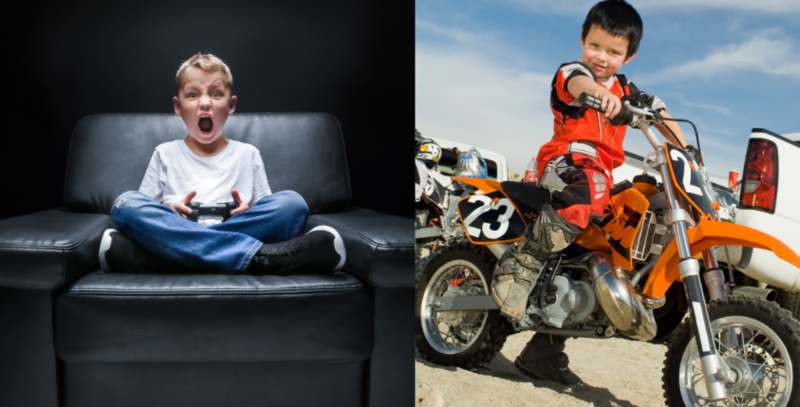 If you have the impression that riding an off road motorcycle or ATV is a sedentary sport consisting of sitting and twisting a throttle you might be surprised. A York University study found the physical demands of off road riding similar to jogging or calisthenics and it’s also a whole lot of fun. Riding opportunities also exist for kids with physical challenges. The Ontario Camp of the Deaf incorporates riding dirt bikes and ATVs into their weekly programs for hearing impaired kids. I was honoured to have been present when a young lad by the name of Cameron rode an ATV for the first time. This was so special because Cameron was born blind. I can’t put into words the emotions of a kid that has faced challenges their whole life when suddenly their impairment doesn’t restrict them from things that regular kids do. In the 70’s a movie by the name of “On Any Sunday” kick started a whole generation of young motorcycle riders. This came at a time when you actually had to go to the theater, there was no streaming option. While many things have changed, passion remains the same. Passion is like potential, if you can unleash a child’s passion for life, success will be yours. For me and my family it was dirt bikes. The right cause and the right direction can lead to a healthy life with many peaks and few emotional valleys.